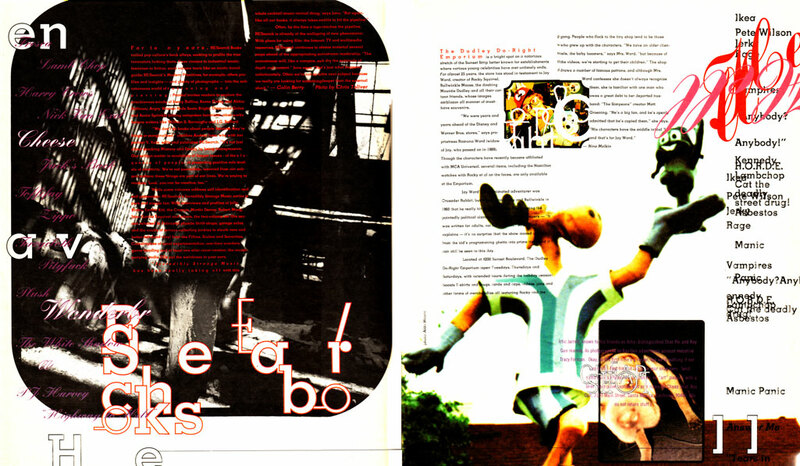 With the full arrival of the "Information Age," the magazine that gave voice to the "digital generation"
During the 1990s accelerating progress in computers, software, and output devices allowed editorial designers to apply computer experimenation to their pages. David Carson not only changed the look of youth oriented magazines, but he provided opportunities for talent new designers and illustrators to express their style. Post-Modernism in the nineties evolved into a mannerism that reveled in the complex integration of type and image. Costly special effects became commonplace, space became irrational, and experimental ruled the day. Inspired by Émigré, Fuse, and grunge, this hybrid called Controlled Chaos allowed for the assimilation of the most advanced technology to the least sophisticated vernacular. “Cover of the Year” from the Society of Publication Designers in New York. and distribution cause of fab art-director David Carson. He broke the rules in every way. and creating absurd compositional layouts, such as backwards text settings and columns of texts that bled off the page or aligned or overlapped eachother. Yet he still abides by the principles of design. Even using negative space to compliment the chaotic elements. 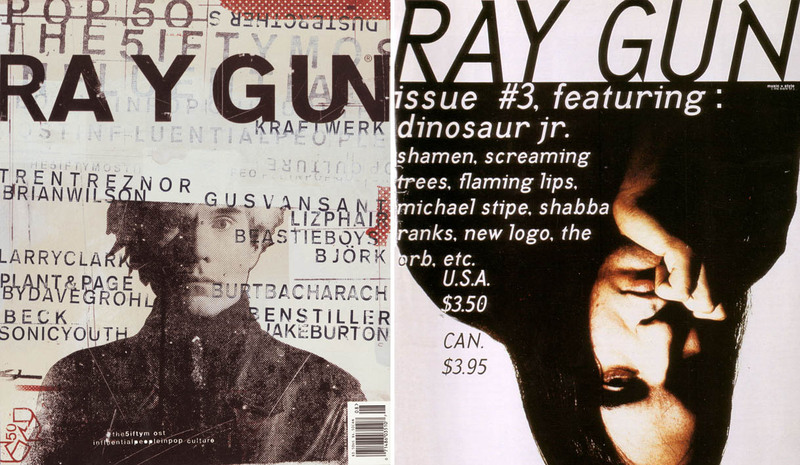 Appointed art director of Ray Gun magazine in 1992.
and Carson himself found them surprising. David Carson opened the door to a new way of working in the editorial world. Since the end of Ray Gun, Carson’s style has often been imitated, but never improved. Carson's illegibility was decried and denounced but designers discovered many readers were more resilient than assumed and messages were read. He explored reverse leading, extreme forced justification, text columns jammed together, and minimal contrast between the text and the background color. how the music spoke to him. reader to decipher the message. article titles were letter spaced erratically across images or arranged in expressive rather than normative sequences. boring and not worth reading. typeface, which is made up of symbols rather than letters. He also treated photographs and images in unconventional manners.